Product Description: The McCulloch MC1275 Heavy-Duty Steam Cleaner is a professional quality solution for those who are serious about steam cleaning. When it comes to cleaning carpets, upholstery, and other furnishings, doing it with just soap and water won’t do. This can leave stains, residue, and other dangerous substances that can allow bacteria to thrive. Ideally, getting yourself a steam cleaner capable of cleaning these furnishings would work, but which one should you pick? 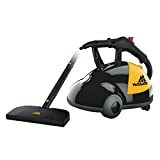 If you want a very powerful steam cleaner that can also clean items like grills and even your entire garage, you should take a look at the McCulloch MC1275 Heavy-Duty Steam Cleaner! Steam Lock Switch – Want to keep the steam from coming out consistently from the machine? All you have to do is push the steam lock switch and the steam will come out consistently without stopping. Powerful Jet Nozzle – If you want to focus on a specific area, the jet nozzle can focus on the place you want the steam to target and help get rid of the dirt in the spot. Attachment Functions – Transform your MC1275 to a heavy duty steam mop thanks to its floor mop attachment. You can clean your flooring whether they’re sealed, wood, or laminate, with ease with this attachment. 48 Ounce Water Tank – This steam cleaner can take 48 ounces of water, allowing the machine to create steam for up to 45 minutes. Scrub pad attachment – If you want to clean larger surface areas, this steam cleaner has a scrub pad attachment that can be used for these types of cleaning needs. Utility Brushes Included – The system also comes with utility brushes which can help you clean the toughest grime and grease in your grills, ovens, toasters, and other heavy duty areas. Full package: When you get your MC1275, you get a carrying handle, a steam jet nozzle, 2 extension wands, a mop head, 2 microfiber pads, a water funnel, a measuring cup, a squeegee, a triangle brush, 5 nylon utility brushes, a brass utility brush, and a scrub pad. Satisfied users have said that this steam cleaner is an investment that they were happy to make given the efficiency it delivered. They remarked that the steam it created lasted for a long time, reaching up to 2 hours and even to 3 hours depending on your usage. Users have also remarked that it was able to clean up organic build-ups and darkened grout, effectively removing them without harming the surface. The package was also positively received by users since they said it can be used on various surfaces and hard to reach areas. Some users who used the steam cleaner on their car wheels said that it was able to clean brake dust and other chemicals on the wheels. Satisfied users – especially those with allergies and asthma – have also said that they love the fact they did not have to use chemicals that can be dangerous for their health. Sounds like the McCulloch MC1275 is a powerful steam cleaner that you would want in your home, isn’t it? However, is it really that good? Well, several users have highlighted problems with this steam cleaner. These users have remarked that this machine’s steam lacks the pressure necessary to clean efficiently, especially if the buildup is very heavy. The temperature is also a questionable point for some users because it was not hot enough to produce powerful steam that can clean right away. As a result, it softens the dirt, making cleaning more difficult as it may then spread. Some also question the size of the attachments included in this machine because they cannot quickly do the task efficiently. Others have also expressed their disappointment because the machine was only able to remove stains that could be cleaned easily with a sponge or traditional cleaning methods. Some users have also said that it does not work well in places like BBQ grills because the unit was unable to clean all the accumulated grime. There were also users who said that the machine is too noisy. With regards to durability, some users have commented that the attachments are not too durable as they could not withstand the heat. McCulloch has been in the industry for more than a decade, creating the best steam cleaning products one can ever want in their home. If you want a powerful, durable, and effective steam cleaner that will last you years, invest in a McCulloch!